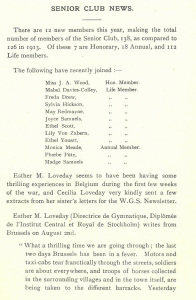 During the events of World War One, staff, pupils and those who were registered in the Senior club, led fascinating lives. The pupils worked hard making sandbags, woollen goods and garments for soldiers, prisoners of war and those in need. 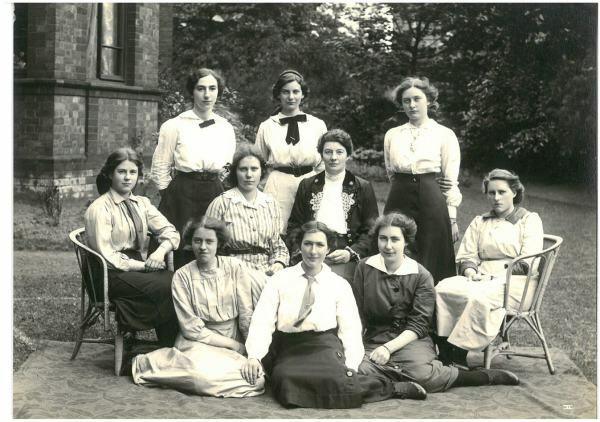 Young women who had left the school worked in numerous positions and experienced events that are hard to imagine today. 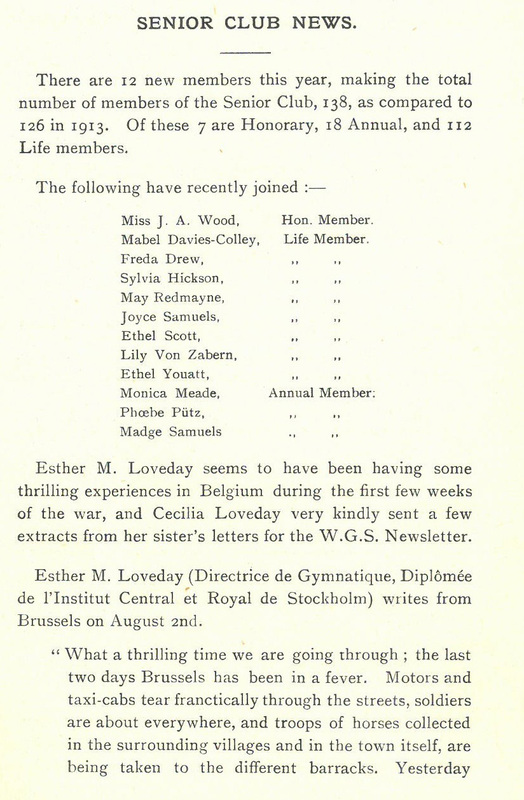 One of Withington’s former pupils during the war was Esther Loveday. 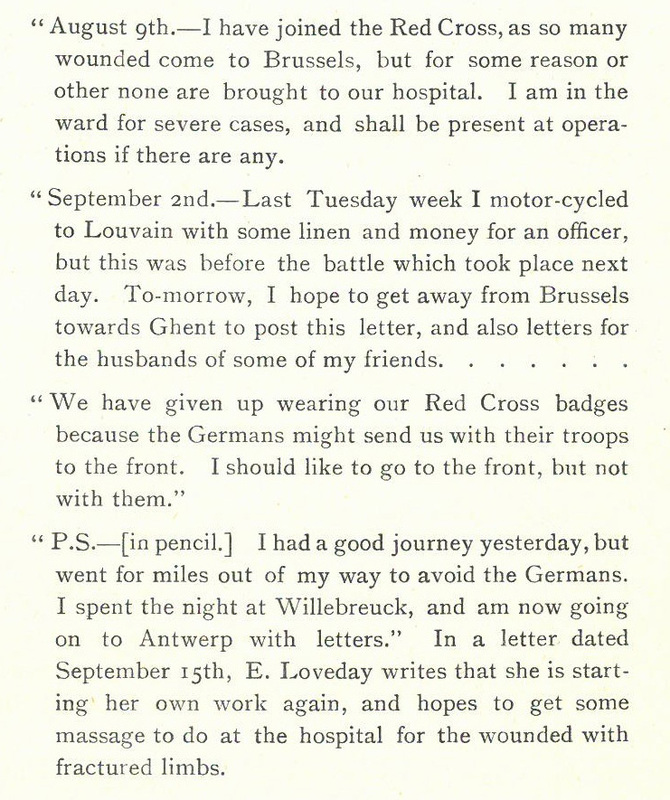 Esther went to assist the war effort in Europe, joining the Red Cross in Brussels. 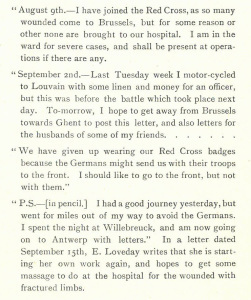 A sample of her War anecdotes can be read in the two images below. Please click on the thumbnails to expand the articles. 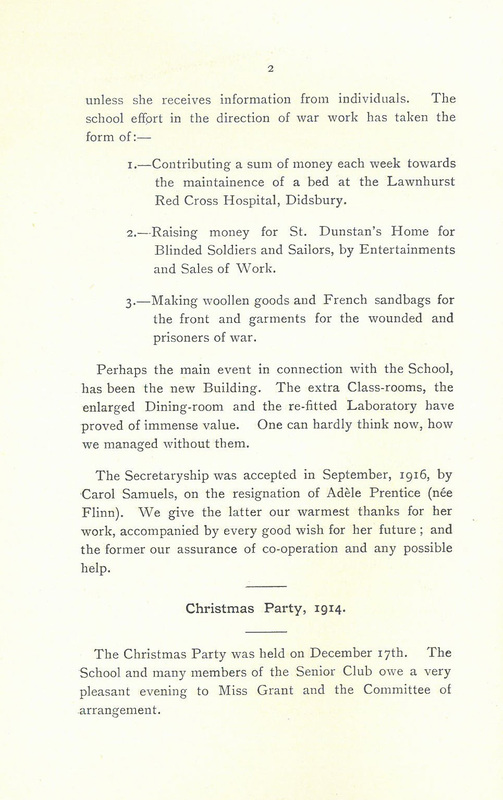 It is recorde d in the newsletters from the war period that the school made every effort to donate a weekly sum of money to Lawnhurst Red Cross Hospital in Didsbury. This building was the home of the Simon family, who generously provided the space that was needed for the recovery of soldiers. 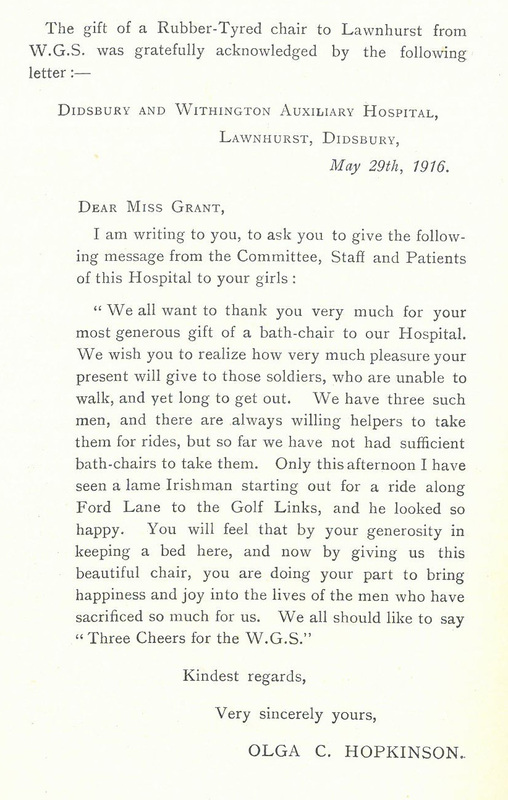 Below is an excerpt from the 1916 newsletter. This records a letter from Lawnhurst, gratefully acknowledging the gift of a Rubber-Tyred chair that the pupils fundraised towards. Please click on the image to read the item. 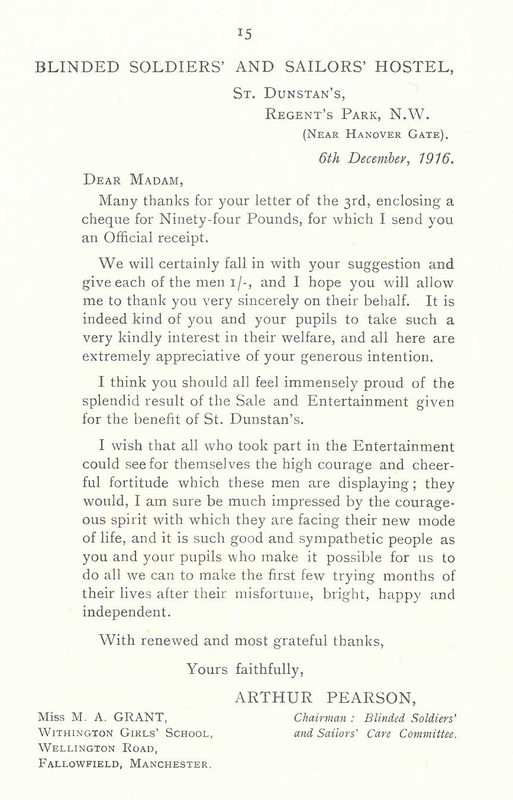 Girls regularly ho sted and organised fundraising activities for Dunstan’s Home for Blinded Soldiers and Sailors. We have numerous records of the Arts and Crafts events in a scrapbook of exhibition notices. 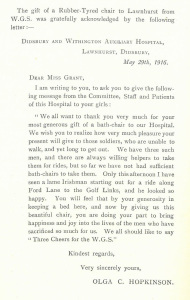 Part of a school notice from 1914 reads ‘The committee much hope that you will send an exhibit, and will come to see the work, bringing any friends who may be interested. The ordinary plan of not allowing anything to be sold is being altered this year. 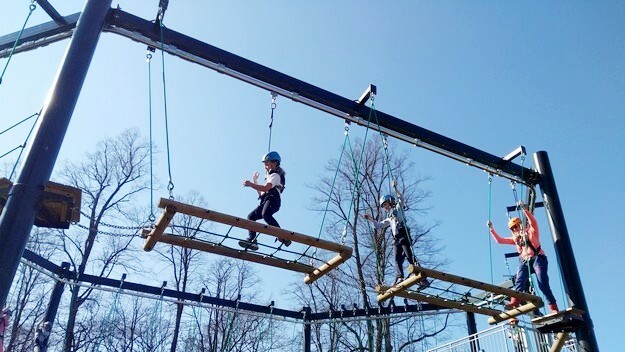 Girls have suggested utilizing the opportunity to contribute something to the national need, through their own work.” The pupils’ generosity and hard work did not go unnoticed. 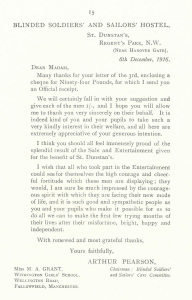 Here is a letter from St Dunstan’s thanking the school for its donation of £94. 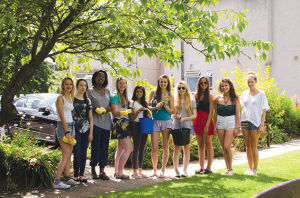 Pupils to the present day, support those less fortunate through a busy programme of charity fundraising events and outreach projects at Withington Girls’ School. One of the most recent is the annual school fashion show that raises money for Barnardo’s amongst another nominated charities. Similarly to the Arts and Crafts Exhibition tradition, the PTA host the Annual Spring Fair. 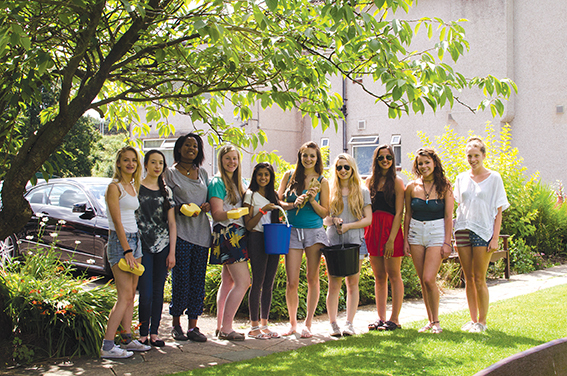 In 2014, the girls helped to raise money for a new school minibus through the sale of home cooked goods, jewellery, garden objects and fashion. Below are two recent photographs, the first taken during a fundraising event at Northenden Golf club in aid of the Uganda project. 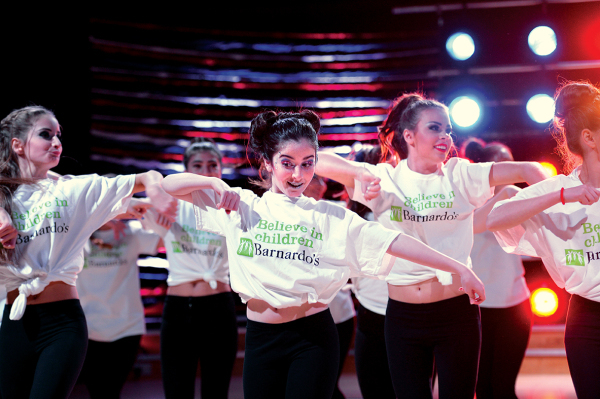 The second image was taken during a dance performance at the school fashion show. This wonderful photograph shows the nine 6th form students in 1914. We are extremely lucky to have a collection of beautifully hand written report books within the archive. By looking at these resources, we can learn the pupil’s names and gain an understanding about the curriculum that they studied. 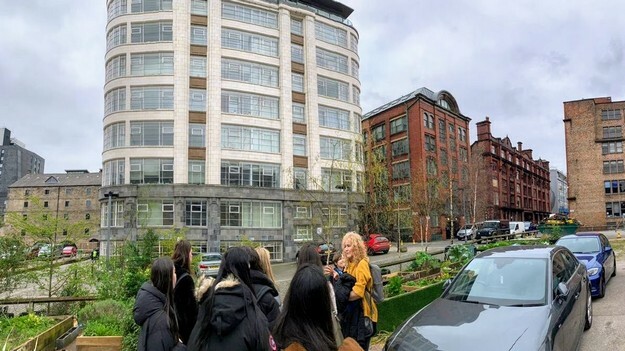 We can see from the destinations and careers that the pupils progressed onto, that they were high achievers, even during the difficulties of Wartime Britain. Sitting in the armchair on the far right of the photograph is Ethel Youatt. At this time she lived in the family home in Didsbury. Ethel was Head Girl and is marked as performing “Excellent work’ in Gymnastics! She went on to study Pharmacy at Manchester University and became an Assistant Demonstrator in Pharmacy before her marriage to Hubert Dunning in 1919. Sitting on the ground in a dark dress with a white collar is Sylvia Hickson. Sylvia studied Medicine in Manchester after her enrolment at WGS. She worked as a consultant, specialising in the care of babies and was part of the Medical Women’s Federation. An eminent doctor in the North West, Sylvia was the first woman to become MRCP (Membership of the Royal College of Physicians) in Manchester. 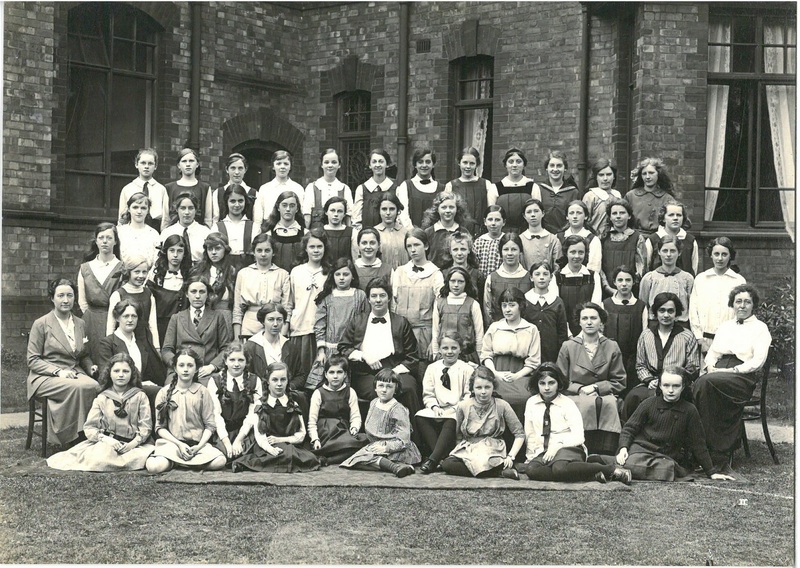 Other girls in the 6th form photograph include Marjory Knott who was head of the school in 1914 – 1915. Her Algebra and Arithmetic was rated ‘Good’ in the Summer Term alongside her Geometry being ‘Very Good’. This must have been an understatement as she went on to study an MA in Mathematics at Edinburgh University! Jeanne Drey and Carol Samuels both went onto study Arts. Carol later became the Senior Club Secretary in 1916, however, this was suspended while she was doing war work in London. In addition to supporting the national need during the war period, WGS was still committed to providing excellent learning facilities. 1914 – 1915 saw the construction and opening of new classrooms, an enlarged dining room and a new laboratory. 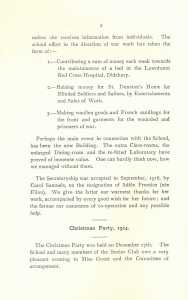 In an excerpt from the newsletter below, you will not only see information regarding the school effort towards the war, but also a paragraph describing the new building. We would love to hear any information regarding World War One memories, especially those linked to former Withington Girls’ School pupils, staff and family. Please feel free to get in contact with the archive by emailing archive@wgs.org to discuss any items and written material that you may have. Thank you to Barbara and Cathy (both WGS Alumnae) for your contributions to this article!